Each class creates a ‘Class Treaty’ which gives examples of the values in practice with clearly stated expectations for all to follow. These T.E.R.A values are regularly taught in all classes at Newton following ‘Our Values Teaching Matrix’. 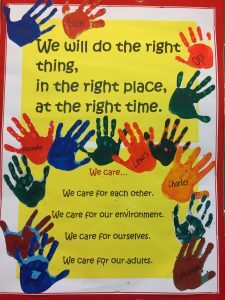 There are positive reward systems school wide and in all classrooms, reinforcing the behaviours that reflect these values. Students regularly receive feedback on their learning and behaviour development.